https://sep.yimg.com/ay/yhst-33477391359232/asfur-angelfish-pomacanthus-asfur-arusetta-asfur-asfur-angel-fish-6.jpgAsfur Angelfish - Pomacanthus asfur, Arusetta asfur - Asfur Angel Fish ModerateSemi-aggressive135 Gallon15.7 inchesYes, with CautionOmnivore, Greens, Pellet, FlakeRed Sea and Indo-PacificPomacanthidaeSmall 2" - 3"
The Asfur Angelfish (Arusetta asfur or Pomacanthus asfur) is sometimes called the Purple Moon Angelfish. It is best to only keep one per tank. They are from the Indo-Pacific region.Water quality must be perfect, and the tank been setup at least 4 months before adding. These fish are somewhat territorial. Due to dietary concerns, Asfur angelfish can be difficult to keep. Getting one to feed in captivity can be problematic, and if they are not eating in the store when purchased, almost impossible. 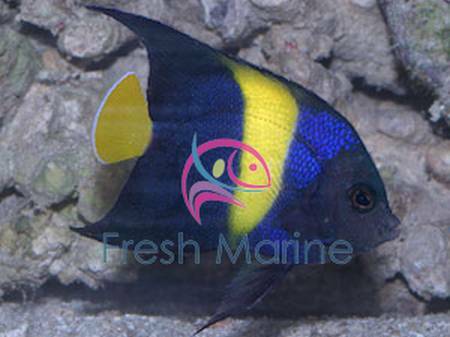 If feeding well on a varied diet, they do prove to be moderately hardy as Angelfish go. Mussels, Shrimp, Algae, Romaine Lettuce, Krill, and other items will be a good start at a good diet. Since they are grazing omnivores, feed about three times a day in small quantities. It seems as if the Max length of Asfur species is totally undecided upon. One source lists 6 inches, two list 9 inches, and two sources list 15 inches as Max length. Sources are limited, and the other sources list lengths between these numbers. A temperature of 77-82 is ideal. Quarantine all of your Angelfish first, as this will greatly increase your success. Asfur Andgelfish is not known to be overly reef safe, but there may be exceptions to this rule that we haven�t discovered, such as a group of inverts they won�t touch. Recommended Tank Size : 135 Gallon . Asfur Angelfish are somewhat shy species, so provide plenty of rockwork for hiding places. Specific Care Information: It is important that you feed angelfish all kinds of live, frozen, and prepared formula foods. Best to feed small amounts several times a day. A good formula that can be made at home consists of mussels, shrimp, squid, and spinach. Should be fed an angelfish formula that contains sponge. Breeding and Propagation: Asfur Angelfish are not accomplished in captivity.